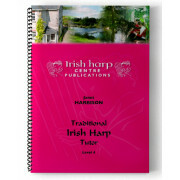 This book is a support manual for the Irish Harp College oral training system. For the student: It is a back-up to live lessons with a teacher or the CDs accompanying this volume. For the teacher: It is a manual for both teacher and student to work through together – particularly for teachers of the ‘classical’ tradition who wish to explore an oral method of instruction which has proved to be significantly effective in training the ear, creative play (composition and impromptu arrangement) and social music-making (as in a ‘Session’). For the parent: It is a manual also for the parent’s interest to follow with the student - assisting in the consolidation of the current lesson material, invaluably enhancing the student’s experience of learning with encouragement, affirmation and discussion on the music, history, theory, general knowledge and skills being developed. For the Enthusiast: It is a manual that elucidates the method and style of traditional Irish harping today and offers a valuable handbook to all harpers and players of all other kinds of harp venturing into the world of the Irish tradition. Level 4, MEDIAN, is the half way point in the training course of 8 levels to the Irish Harp College Graduation and is also the completion to the first phase of training with students preparing a 'concert programme' of an approximate half hour duration with a repertoire representing a broad mix of music in the harp repertoire. The course is designed to take an average 12 year old beginner to an advanced level of competence within 4-8 years with separate access to (Preliminary) course for older or younger beginners who need a gentler induction. Both Junior and Adult and the Levels 1 - 4 course are supported with tutor volumes and a range of other books, manuals, recordings and (currently in preparation) e-learning lesson and material downloads.